There is an Indian concept called “sumscara,” which means “hidden past impressions.” We live in a universe of these impressions, yet we barely notice. If you walk past a coffee shop, you are reminded of a person you met there, and may feel a longing for him. When you go home, every sight you see contains data about the past. 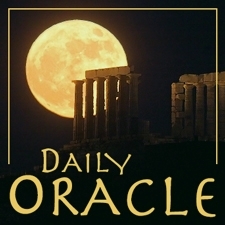 Today’s Oracle takes us to the Virgo weekly for April 23, 1999. There is an Indian concept called “sumscara,” which means “hidden past impressions.” We live in a universe of these impressions, yet we barely notice. If you walk past a coffee shop, you are reminded of a person you met there, and may feel a longing for him. When you go home, every sight you see contains data about the past. There is even scientific evidence suggesting we carry the visual and sensory impressions of our parents in our minds, and can act in ways that are directly responding to traumas that they faced before we were born. The first way to be free of from this conceptual prison is to be aware. Notice what you are seeing, and what it means.